Don't panic, this does not equal badge engineering. It would make sense for BMW, parent company to Mini, to do a bit of sharing with the sub-brand when it comes to the smaller BMW-badged products, right? Well, maybe and maybe not. The urge to share with cheaper brands has done a number on several luxury brands, but it does seem that BMW might have found a way to make it work in this case. 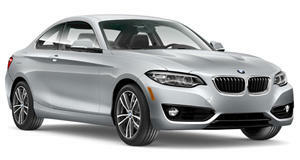 The 2 Series will be getting the same 134-horsepower 3-cylinder engine as the Mini Cooper, true. But there remain some important differences between the two cars, chiefly that the BMW will have the engine mounted longitudinally, with the power going to the rear wheels. Not only that, but the automatic transmission offered in the 2 Series will have eight speeds, rather than the six found in the Mini. This all makes for a 50/50 weight distribution, but there is a bit of bad news. The 2 Series is predictably a bit heavier than the Mini, and the 8.8-second 0-62 time means that the car is more than a second slower than the Mini. We’ll have to wait and see if BMW’s customers mind.